Build a wonderful dog training field with our outdoor dog training practice agility exercise kit. The agility training set is constructed of EVA plastics which is soft and safe enough for your dog to jump up and down. 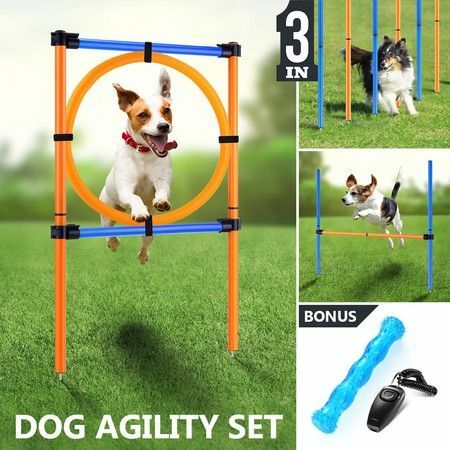 Equipped with weave pole, jump hoop, dog chew toy and training whistle, this dog agility equipment will greatly stimulate your dog to exercise and cultivate his/her healthy lifestyle. The carrying bag makes it easier for storage and transportation. 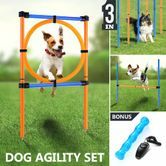 Suitable for the backyard, park, beach and other places, order the dog agility training set to bring endless fun and enhance a deep relationship with your loved dogs. 3 in 1 Dog agility starter equipment. The kit nurtures the relationship between you and your dog. Help you and your dog get exercise. Light-weight, easy to assemble dog agility starter equipment. Comes with convenient carrying bag for easy storage or travel. Quick setup and easy to change height.